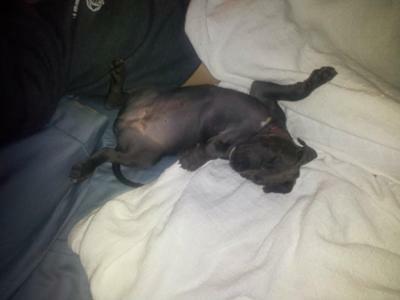 Marley is a 12 week old blue nose little girl. We met at a shelter when I went to actually look for a cat. When we saw each other, it was love at first sight. 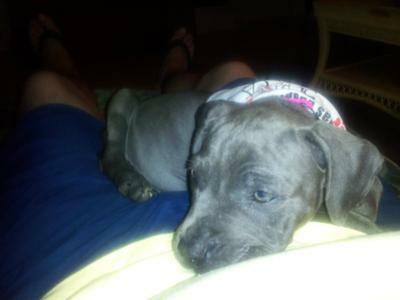 She was so tiny and sickly ( 7-weeks old at that time. But it didnt matter. I knew i had to have her in my life. Everyday I get the best puppy kisses and hugs. She always tries so hard to please me and will do anything to get her "frosty paws" treat. 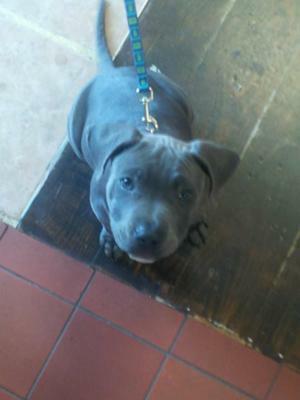 She is in training to be a dock dog where she will greet people in the ship store and the boats coming in the marina. She is doing well with people--just still a lil "chompie" at times. But getting the hang not to do that. Everyone who meets her wants her and says she is the most beautiful baby they have ever seen, and she is. She most likes to have her morning nap in bed with me, rather than her pen, but at night prefers her bed. She loves to tease her kitty friend and vice-versa. I am so lucky to have such a great fur baby. She's silly and sometimes just calm and thoughtful..
She is adorable and so glad you found each other. It always makes me smile when people discover how loving and beautiful these creatures are. They are very loyal and the best friend ever. Awwww she's a cutie!! I have a Marley pibble too!! Mine is now 4! 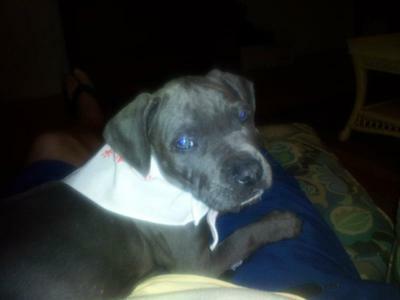 He is blue brindle and very handsome & BIG!! 90lbs if muscle & love all rolled into 1!! Enjoy ur new baby, they grow up way too fast just like kids! !